1. 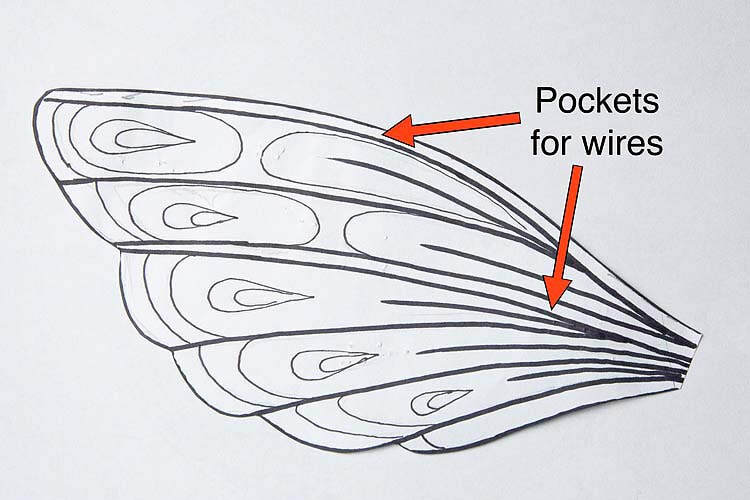 Draw a wing design, making sure to include two pockets for wires. Cut out pattern. 2. Pin pattern onto double layer sheer fabric. Trace upper edge of pattern onto fabric and cut out fabric leaving plenty of excess around outer edges or pattern. *Only the top edge is cut with a 3/8" seam allowance. ​3. Fold back body edge of wing and sew along top edge of wing. Clip the curve with scissors. 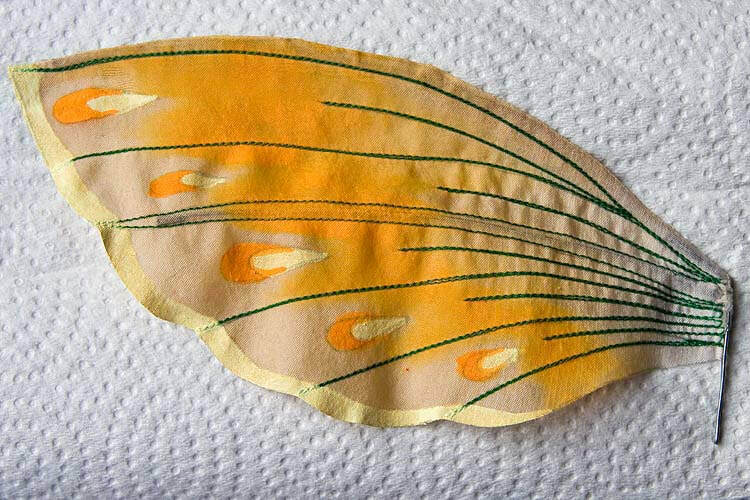 Turn wing right side out and press using a soft cloth to protect the fabric from direct contact with the iron. 4. 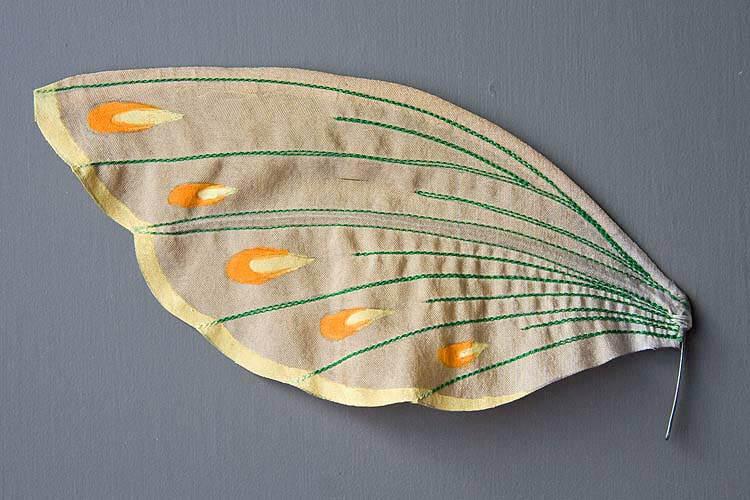 Pin sewn wing onto pattern to keep it from moving, and trace veins and designs onto fabric with pencil. ​5. Using a thread matching the colour of the bodice, stitch the vein lines. 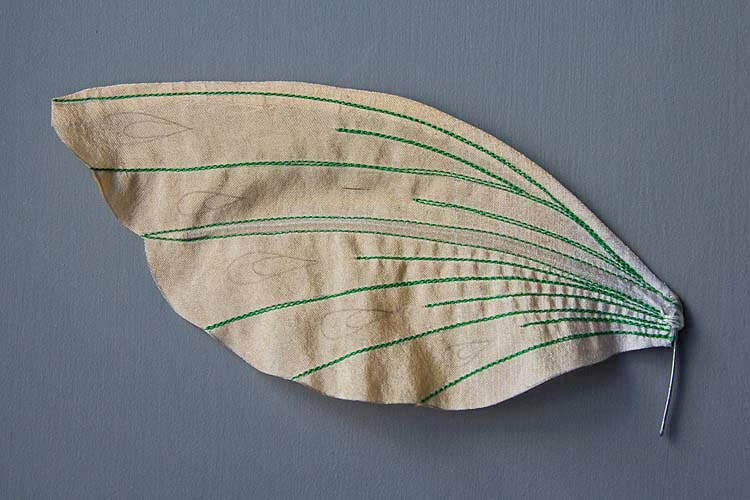 Start at 'body end' of wing, stitch out to end of vein line, turn and stitch back, then stitch next vein line. 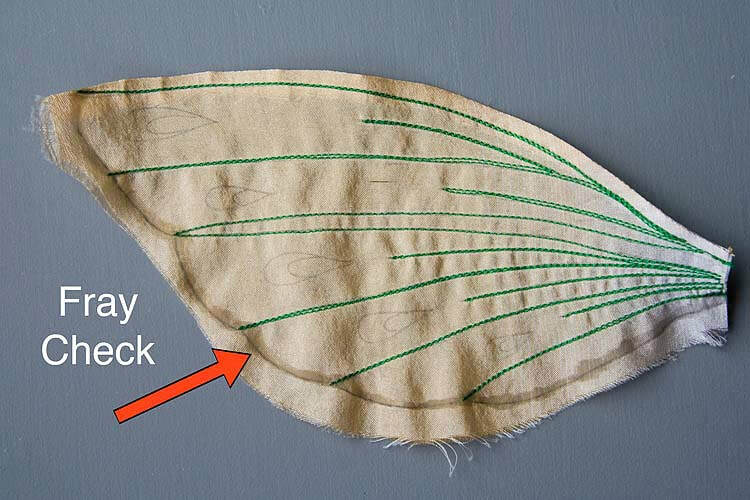 *This is why you have extra fabric beyond edge of wing - to make stitching to edge of wing and tuning easier. 6. Press wing, then trace outer edge onto fabric. 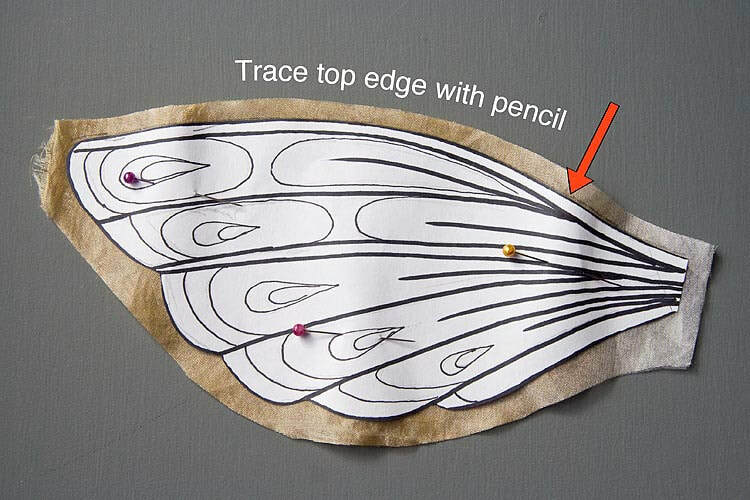 Draw a line of Fray Check along outer wing line. Let Dry. Cut outer wing edge being careful not to clip ends of sewn vein lines. ​7. Using pliers, bend wire to fit into pockets. 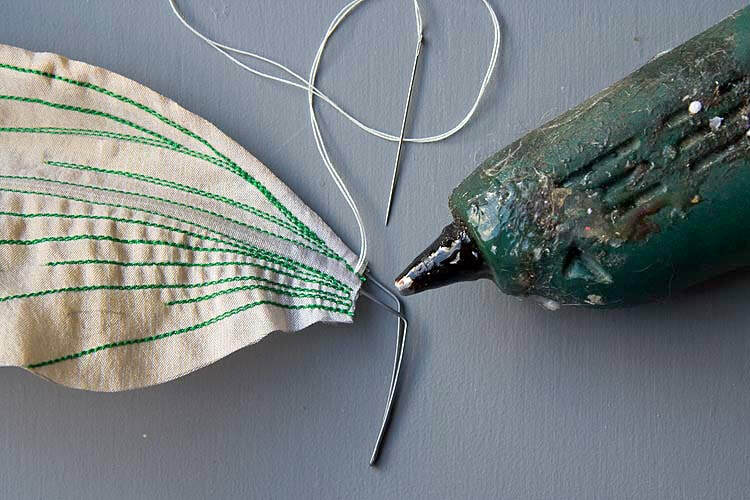 The thickness of the wire depends on the size of the wings being made. 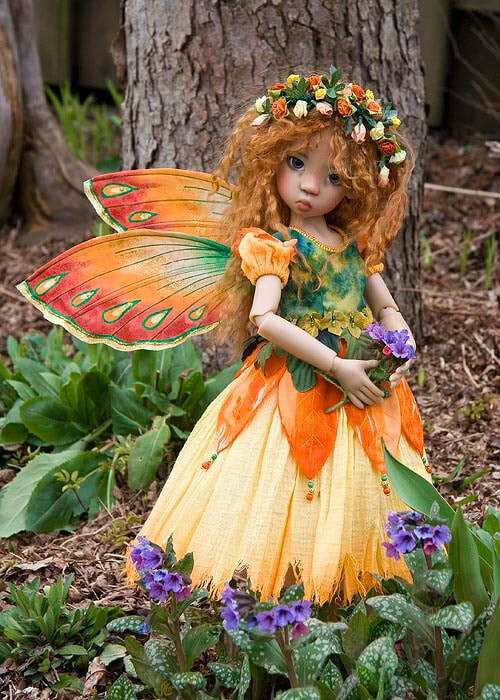 Very large wings will need a heavier gauge but tiny wings will need a lighter gauge. 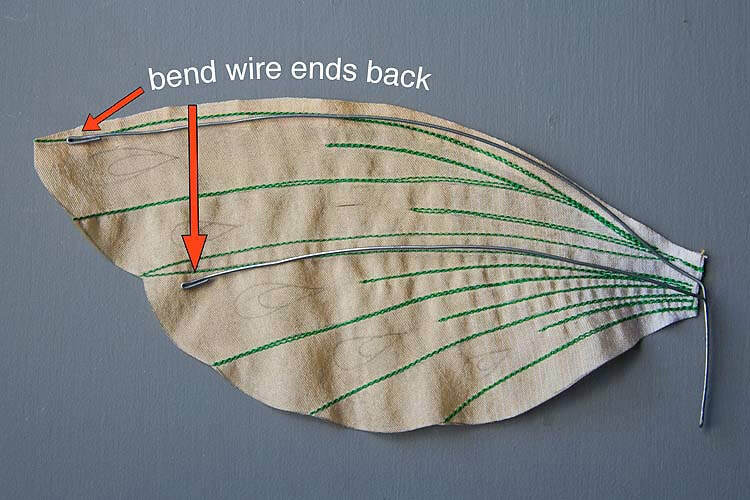 Start with upper tip, bend a little bit back on itself to create a blunt end, Laying wire along sewn wing, measure wire along upper pocket, then bend down at 'body end'. Leaving 1 1/2" of wire for pocket, bend wire back up tightly with pliers. About 1/4" below upper wire, bend second wire out below it. 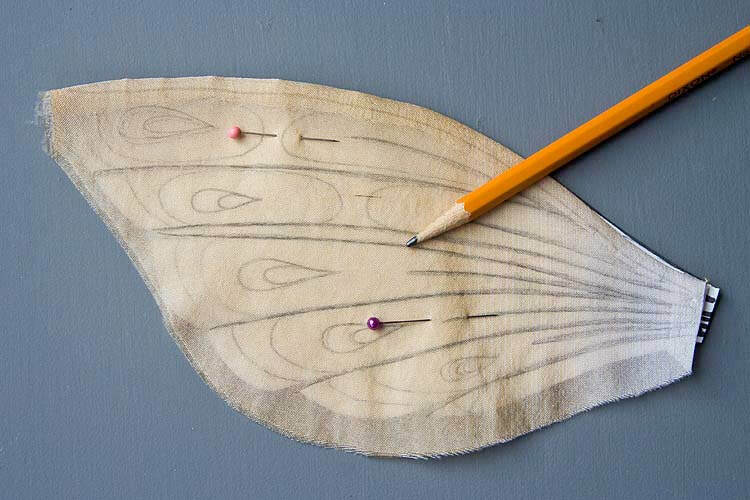 Measure along fabric wing, cut end and bend under the end of the wire to make a blunt end. ​8. 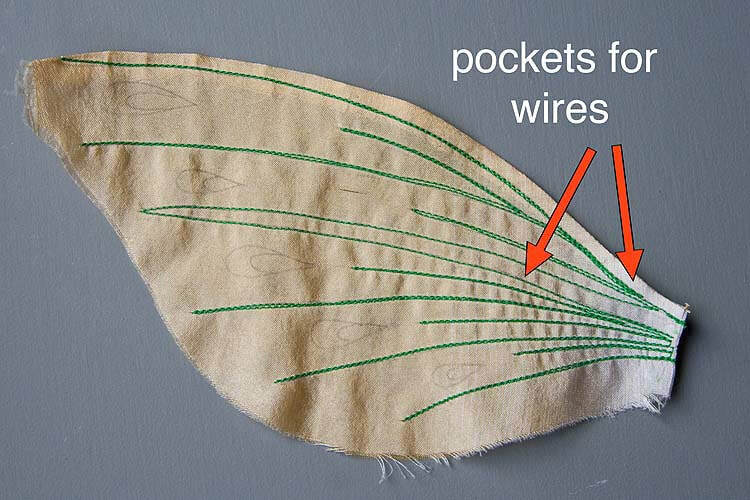 Insert wires into fabric pockets. Thread needle with strong thread, knot end, and thread through one of the wing pockets. Pull fabric back along wires, apply a bit of hot glue to the two wire ends and pull fabric back over wires. 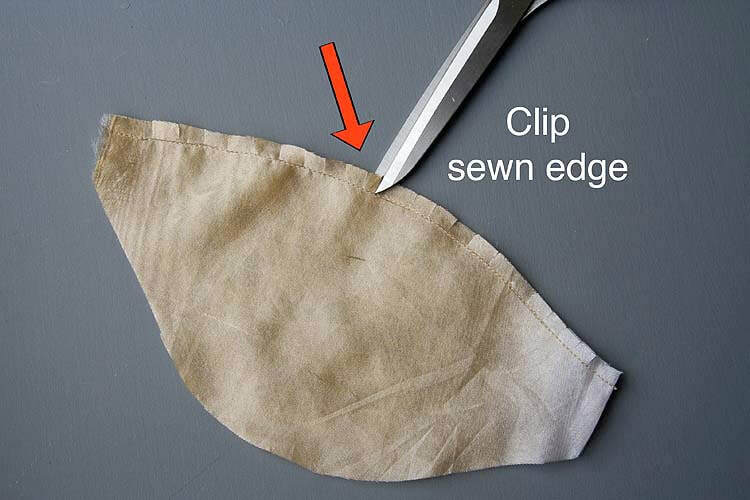 Quickly stitch securely with needle and thread. 10. 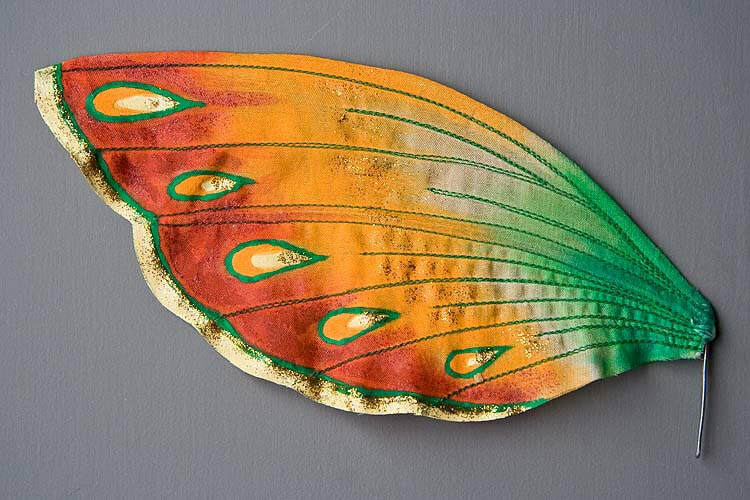 Paint any 'hard-edged' parts of your wing design with acrylic or folk art paint mixed with Textile medium. ​Let dry, then paint same designs on other side. Let dry. ​11. 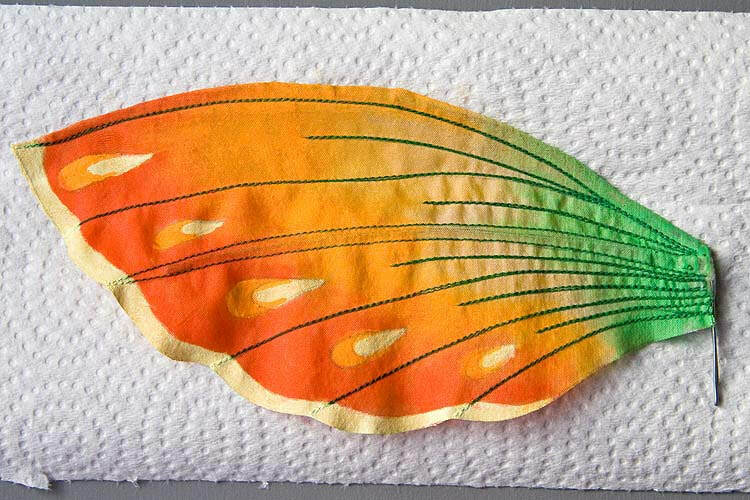 Soak wing with water, lay on paper towel. Mix desired paint colour with equal part textile medium and dilute with water. Using a soft brush 'bleed' the paint onto the wet wing. 12. 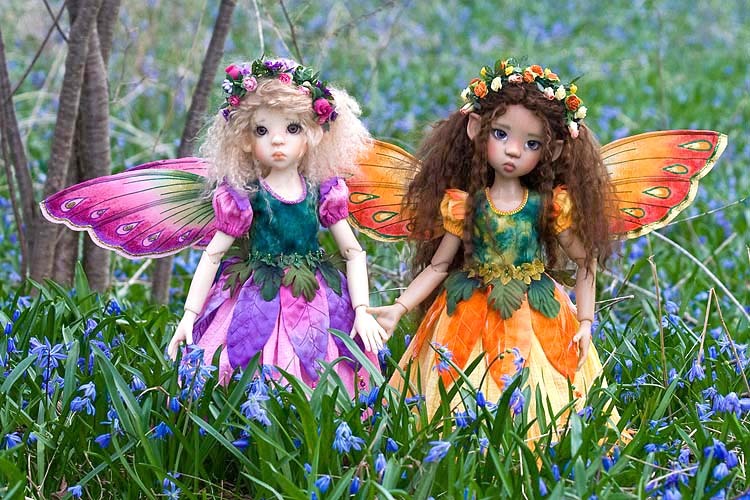 Repeat with outer and inner wing colours. Let dry. 14. 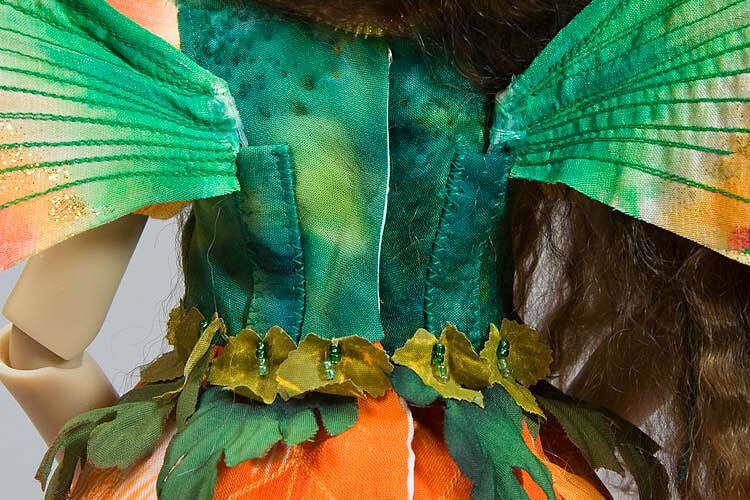 Sew long thin pockets of the same fabric as bodice onto back of bodice. Insert wing wires.